SIZES & LEVEL: 2 bedrooms, 2,015 sq. feet, 1 level, 35th floor. RATES: Rates varies: Low Season/ High Season/ Holiday Season. From $1000 to $1400 nightly prior to taxes. Promotional rates apply for longer stay. Please contact us at rentals@jtchawaii.com for more information. This refined 2,015 sq ft penthouse residence optimizes simple elegance. Beautiful etched glass and cherry wood parquet flooring are found just inside of the double-door entry which prepares you for stunning panoramic views from ocean to mountain. The two ensuite bedrooms--one with a French-inspired slated indoor patio are on opposite ends for maximum privacy. Each bedroom is beautifully furnished with the most luxurious bedding, wonderful artwork, and decor. The indoor patio is just the perfect place for your morning breakfast or sunset cocktails. The building has a state-of-the-art security system, cameras, electronic keys to access the parking garage, building and elevators for added safety. 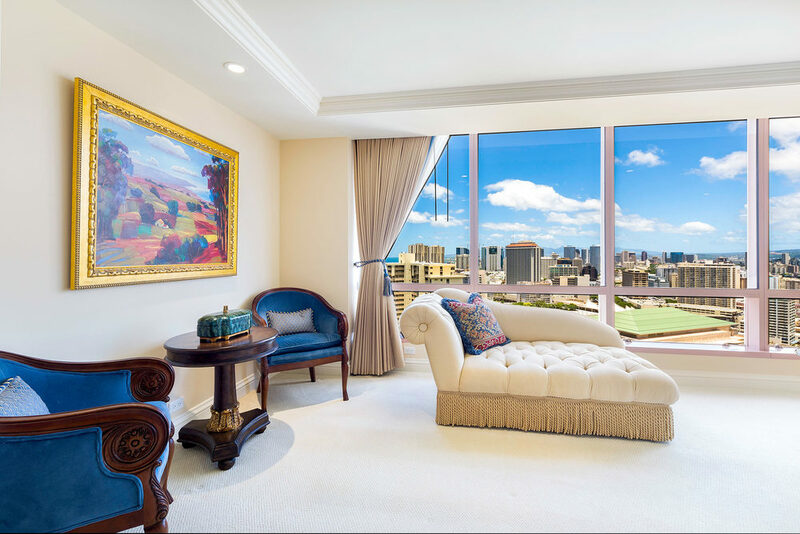 Conveniently located near Waikiki, you will be within walking distance to world-class shops, restaurants and beaches. This luxurious condo has the comforts of home, a relaxing vibe, with a touch of elegance.